When you want oral health and a nice smile, you must keep your teeth and mouth clean. 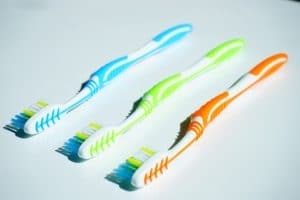 Some prefer to brush after every meal, but you do need to brush at least twice each day. If you have noticed a sticky, soft film on your teeth when you have not brushed, this substance is known as plaque. Plaque is filled with bacteria. Much damage can occur if plaque is not removed. It can start to destroy the tooth enamel, eventually leading to tooth decay. The plaque build-up can also harden and create tartar. While tartar can lead to gum disease, it can only be removed by dental instruments. You can avoid all of these complications by not allowing plaque to build up on your teeth. As the bacteria accumulates while you sleep, as well as during the day, a good start is to brush every morning and every night. However, it is a good start but it is not your only option. To further reduce plaque build-up, brushing after eating is a helpful habit to develop. When you eat, you do not swallow every bit of food. Tiny food particles stick to your teeth and between your teeth. Bacteria feed on these particles, and more plaque is produced. While products containing sugar cause the most damage, brushing after eating will keep your teeth healthy. As plaque can build up between the teeth, you should also floss regularly. It only takes a couple of minutes to use dental floss, and you will be rewarded with plaque-free teeth. If you think about it, your mouth does not seem fresh in the morning. It may have an unpleasant taste, even if you do not notice the odor. Fresher breath starts with brushing twice a day, but it will be fresher yet if you brush after eating. Perhaps you notice a lingering taste when you eat food that has a strong flavor. People you talk to notice it, too, even if they do not comment. You do not need to eat fish or garlic to have unpleasant breath. If you want to eliminate bad breath entirely, always brush after you eat. It’s not difficult to schedule brushing and flossing into your day, but not doing so can cause many problems. Oral health must be a priority because you do not want to cope with gum disease or cavities. Your personal confidence is important, too, because you want to present yourself to others with clean teeth and fresh breath. Whether you choose to brush twice per day or after every meal, this can be the day you develop good oral care habits. When it is time for your next visit to the dentist, do not be surprised if there has been an improvement in your oral health. You may not have any plaque build-up or tartar, and your breath will be sweet and fresh. Contact our office for more tips or to schedule an appointment. Can Flossing Help Prevent Tooth Decay?How Do Teeth Whitening Products Work?